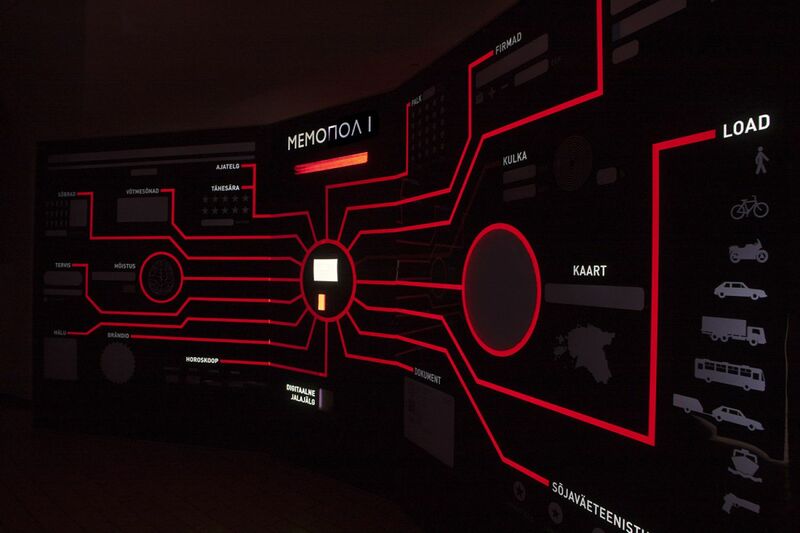 Memopol is a machine that maps the visitor's information field. By inserting an identification document such as a national ID-card or passport into the machine, it starts collecting information about the visitor from (inter)national databases and the Internet. The data is then visualized on a large-scale custom display. People using the machine will be remembered by their names and portraits. The Cyrillic spelling of the installation’s name refers to George Orwell’s concept of Big Brother from his dystopian novel “1984”. Over the past decades, technological means have transformed the surveillance of society. When surfing on the Internet, paying with an ATM card, or using an ID card, people leave their digital traces everywhere. Internet and social networks gather and provide a great deal of personal information, and a person’s profile is no longer constituted by his or her physical being alone, but also by the person’s digital information, over which he or she sometimes has little control. Background checks through Internet search engines and social network sites have become routine when we meet somebody new or apply for a job. Memopol enables us to make a thorough background check of ourselves, mirroring back to us all the data about us that is recored. Estonia is well ahead of other countries in governmental data collecting, storing citizen information online and making it accessible to individuals and third parties. Estonia has used electronic ID-card for 10 years and has built a system that interconnects all governmental databases. Simple means to access the data are provided by personal ID-card readers. By logging in the government portal, citizen can see information from prescription drugs to high school exams, from tax reports to driving licenses. All recorded for unlimited time. The online interface is easy to use and has light and green, friendly and trustful aesthetics. Memopol is a reaction to these developments and uses contrasting aesthetics. It’s big and evil, dark and scary. It projects present-day technology into the retro-futuristic times. The tools of “1984” are already here, but the question is how do we use them. In the time of peace these tools add a lot of comfort to every-day life, but what happens when the political winds change.